Blocking is good for your finished projects. We know this, don’t even bother to argue with me about it. I don’t care if you find it to be a hassle, you should still do it. 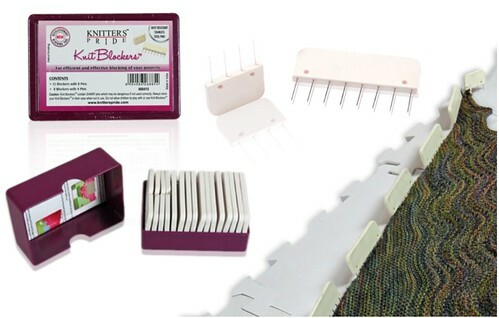 Good news, there is a nifty little product that makes it slightly less of a hassle: Knitter’s Pride Knit Blockers! These little doohickeys come in sets with little blocks that hold a series of 8 or 4 pins which really helps when pinning out a straight edge, be it a shawl, sweater, whatever. Which is great, because evenly blocking straight lines is the absolute woooooorst. Now, no more excuses! Make sure every project gets the finishing treatment it deserves. This entry was posted on Sunday, December 7th, 2014 at 6:14 pm	and is filed under Advent. You can follow any responses to this entry through the RSS 2.0 feed. Both comments and pings are currently closed.